Reproduzco la noticia tal cual como la encuentro. Espero vuestras opiniones. 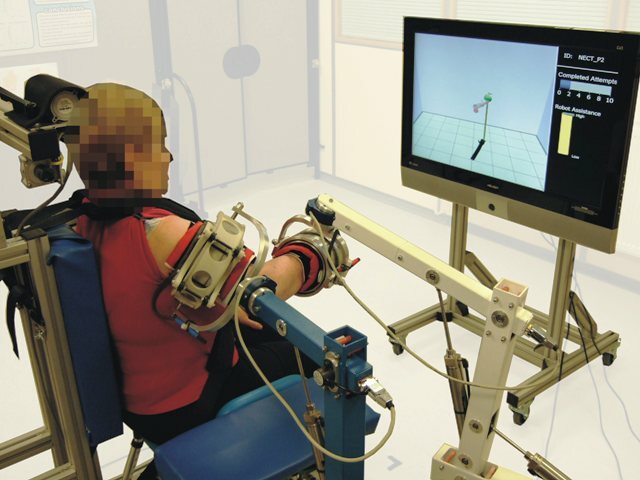 Developing a safe and reliable robotic rehabilitation system that can assist therapeutic arm exercises for people with arm impairments after stroke by providing assistance to coordinate and guide the arm. Using NI LabVIEW software to implement a durable real-time control system for two custom robots that coordinate and assist human arm movements by communicating with a user interface (UI) designed for use by therapists. "The modular nature of the LabVIEW environment has been ideal for prototyping and developing our system." Stroke is the most common cause of chronic adult disability in the United Kingdom. Of the people who survive stroke, 85 percent are left with some degree of arm paresis. After five years, 25 percent of these patients still exhibit some difficulty using their arm, which places a large burden on the UK National Health Service (NHS). After a stroke, rehabilitation facilities use physiotherapy to help patients relearn the lost motor functions by repeating meaningful coordinated movements. Insufficient resources results in patients spending inadequate time undertaking rehabilitation activities, which can potentially limit the degree of recovery. Robotic rehabilitation systems can supplement conventional therapy services to increase the intensity and frequency of rehabilitation. Intelligent pneumatic arm movement (iPAM) is a dual-robot system designed to provide repeated therapeutic exercise to people who are deficient in upper limb movement as a result of stroke. iPAM consists of two pneumatically powered robots featuring three actuated revolute joints that control the end effectors of the robots in Cartesian space. The robots attach to the upper limb in a manner analogous to the way a therapist holds an arm when facilitating movements: one attachment is on the forearm near the wrist and another attachment is in the middle of the upper arm. The orthoses hold the arm and feature three passive rotational degrees of freedom (DOF) to ensure the limb is always aligned comfortably within the robots. Physiotherapists record the movements by guiding the limb through a therapeutic movement via the distal segments of the robot. The system records the forces applied to the arm and movement of the robot joints. The movement can then be replayed by the iPAM system, which assists the patient as required throughout the movement (Figure 1). The level of assistance provided by iPAM can be tailored by the physiotherapist. The iPAM robots are required to provide active motive forces to assist movement of the human arm. Therefore, it is essential that the robots effectively coordinate because misalignment or excessive force applied to the limb could cause pain or injury. To accomplish this, we developed a novel control scheme that operates around the DOF of the human joints rather than the Cartesian end points of the robots. The arm is simplified to a six DOF model with five DOF at the shoulder (two translations and three rotations) and one at the elbow. Because the robots can control three DOF each, it is possible to constrain the six DOF of the upper limb. The human joint angles are not directly measurable by iPAM, so they must be estimated from known kinematic data of the arm and the positions of the relative attachment points of the robots using a direct inverse kinematics formulation for the human arm model. This formulation cannot cope with the measurement errors inherent from the soft tissue interfaces (skin, muscle, and orthosis padding) and with kinematic singularities at the shoulder joint. However, we developed a new iterative formulation using a Jacobian transpose method, which is based on the forward kinematics of the arm and much easier to evaluate. Crucially, the method is aware of measurement error and kinematic singularities. To provide accurate estimation of the arm’s position, 50 iterations of the forward kinematics are processed per iteration of the control loop, which runs at 500 Hz. This places high-computational demands on the real-time controller and necessitates deterministic real-time performance for reliability. By transforming the forces measured by each robot into the upper limb coordinate system, we can implement an admittance control scheme in which assistance can be targeted to particular joints of the upper limb. The admittance control scheme functions by measuring the torque and forces at each human DOF and modulating the desired joint position depending on stiffness and damping parameters set by the therapist. Using high assistance (high stiffness setting) the robot closely follows the therapist's prescribed movement. This is appropriate for patients with little active movement. Lowering the assistance (lower stiffness setting) allows greater deviation from the prescribed movement and is used for patients with a greater range of active movement or as a patient’s mobility improves. Assistance to each joint of the model can be altered independently while preserving the coordination pattern of the movement. We implemented the iPAM real-time controller using the LabVIEW Real-time Module and NI interface cards to perform the signal I/O functionality of the controller. The input sensors comprise two six-axis force transducers, six contactless rotary sensors, three potentiometers that measure shoulder position, and several digital inputs used for safety switches. Analog output signals control 12 paired pressure-regulating valves that drive low-friction pneumatic cylinders at each robot joint. The controller is fully state-based, making the code logical, expandable, and easy to audit. The real-time OS allows deterministic execution of the controller, helping ensure that the entire system is dependable and safe. The physiotherapist uses a client laptop, which is launched with a UI to provide the patient with instructions, exercise cues, and performance feedback to interface with the iPAM system. The client communicates asynchronously with the real-time controller via an Ethernet link using the TCP protocol. The main component of the UI is the 3D workspace representation. Written using the OpenGL-based 3D picture controls in LabVIEW, it allows task-specific information to be delivered in real time to patients. The real-time controller consists of two modules: a high-priority control loop and a low-priority communication module that sends and receives queued data to and from the client laptop. The real-time controller loop runs at 500 Hz. This incorporates the Jacobian estimations of the upper limb positions and the Cartesian position control scheme used by each of the individual robots. We implemented the iPAM system in two small-scale pilot clinical studies by recruiting 26 people with arm impairments as a result of stroke to participate in 20 hour-long robot treatment sessions. Each session consisted of approximately 40 minutes of active robot use. Over the course of the studies, iPAM assisted more than 13,000 active-reaching movements during more than 300 hours of use. Patient acceptance of the system was high and several patients demonstrated an improvement in arm movement. No clinical adverse events occurred during the trials and the real-time controller remained stable throughout both trials. The modular nature of the LabVIEW environment has been ideal for prototyping and developing our system. This work was supported by the UK NHS under the New and Emerging Applications of Technologies funding scheme (NEAT E027). Publicado por Unknown en 10/19/2009 08:00:00 p. m.